Hey, we are getting more activity from the Rockets as the trade deadline is just hours away! There have now been two trades for the Rockets in less than 24 hours. Iman Shumpert was shipped to Houston Wednesday night while Brandon Knight and Marquese Chriss were shipped to Cleveland. Another play is now on their way out of Houston. Shams Charania of The Athletic has reported that the Rockets have traded James Ennis to the Philadelphia 76ers. In return, the Rockets were given the rights to a 2021 second-round draft pick. This is the second trade both the 76ers and Rockets have made as the deadline nears, with the 76ers giving the NBA world a shock by acquiring Tobias Harris. 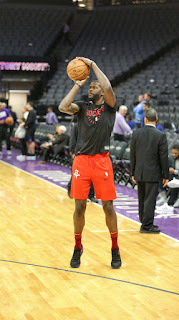 The Rockets were the fifth stop in Ennis' career, with previous stints being with the Heat, Grizzlies, Pelicans and Pistons. Ennis had signed a two-year, $3.4 million deal with the Rockets this past off-season. He had a player option for the 2019-20 season worth $1.8 million. When the trade for Shumpert occurred last night, a topic of discussion came up about minutes between Ennis and Shumpert. Both are wing players who fit exactly into the Rockets' gameplan. An answer has now been made and Shumpert seems to be the option going forward. Both shoot around 37 percent from the perimeter. Ennis had his ups and downs during his time in Houston. He originally was signed as someone who could replace the production of Luc Mbah a Moute and Trevor Ariza, who were key wing players to the Rockets' success last season. There were too many inconsistent moments and some basically called him Corey Brewer 2.0. Ennis had actually been playing better as of late. But for now the Rockets have their sights set on different plans. An open roster spot is now present with Ennis being shipped to Philadelphia. Is another trade on the way for the Rockets? Stay tuned as we will keep you updated.